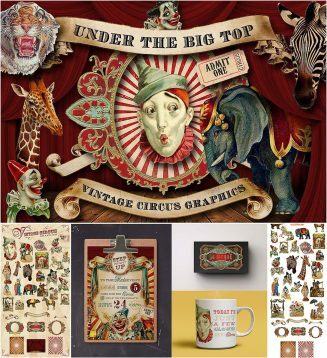 Set of 30+ vintage circus illustrations including clowns, zebras, giraffe, tiger, elephant, bear, ticket, banner, frame and paper backgrounds. File format:.png, .psd for Photoshop or other software. Tags: banner, circus, clown, frame, giraffe, stage, vintage illustration. Hi, can we use this for commercial use? What is your policy? Sorry,but this one just for personal use.